Clear, a brand under Unilever, specializes in making anti-dandruff shampoos for men and women. Clear was developed in 1979 and launched in 1981 and sold by that name in most countries. However, it is called Ultrex in Greece and Linic in Portugal. 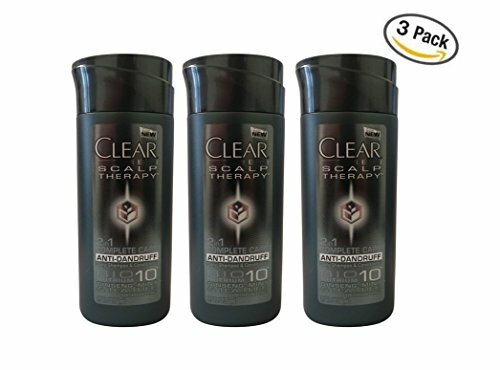 Clear has an anti-dandruff shampoo line specifically designed for men because they understand that men and women have different needs for their respective scalps. Even though women feel they have drier scalps, their scalps actually have a stronger layer of protection compared to that of their counterpart. It is also worth mentioning that men’s scalps produce more sebum than women—one of the reasons why the yeast that causes dandruff is able to thrive. The Clear Men 2-in-1 Anti-Dandruff Daily Shampoo & Conditioner is one of the brand’s shampoos that may help address scalp problems. So, if in case you are shopping for an anti-dandruff shampoo, check out our detailed discussion below as it might be the solution you’ve been looking for. It does not irritate sensitive skin. It makes hair clean and smooth. It contains natural ingredients to help moisturize the scalp and prevent dandruff. This shampoo lathers well and leaves a pleasant smell. It helps relieve itching and minimize flaking. This shampoo is recommended by dermatologists. It works for patients with psoriasis. Its scent does not last long on the hair. It does not work immediately. This anti-dandruff shampoo is specifically designed for men and has been clinically proven to work as long as it is used regularly—recommended to be used two times weekly or as prescribed by a physician. Additionally, it contains chemicals as well as natural ingredients such as tea tree, ginseng, and mint which are proven effective in preventing dandruff. Like most anti-dandruff shampoos, its main ingredient is pyrithione zinc which is known to be effective in relieving dandruff symptoms. It’s also important to note that this product is a two-in-one shampoo so you can be sure that your hair will be more manageable and soft after every wash. Aside from those benefits, it also hydrates your scalp. Clear Men 2-in-1 Anti-Dandruff Daily Shampoo & Conditioner lathers really well and, even though the smell doesn’t last all day, it leaves a pleasant scent after every wash. Dermatologists also recommend regular use. Just like Clear Men 2-in-1 Anti-Dandruff Daily Shampoo & Conditioner, Nizoral A-D also helps relieve dandruff symptoms such as flaking, itching, and scaling. This anti-dandruff shampoo will also leave a fresh smelling scent and make your hair look shinier. Nizoral A-D is recommended to be used twice a week as well and would not irritate sensitive skin just like Clear Men. Similar to the other dermatologist-recommended shampoo, using Nizoral A-D won’t show results right away because you have to wash your hair regularly with it. As for their differences, the dandruff-fighting ingredient of Nizoral A-D is ketoconazole, while Clear Men uses pyrithione zinc. The former also does not contain any natural ingredients; on the other hand, Clear Men 2-in-1 Anti-Dandruff Daily Shampoo & Conditioner has a few including tea tree, ginseng, and mint. Although Nizoral A-D will make your hair shiny, it can leave your hair dry because the shampoo does not contain any conditioner. Finally, Nizoral A-D Anti-Dandruff Shampoo can be used by both men and women; on the contrary, Clear Men, like its name implies, is specifically made for men. If you are looking for an anti-dandruff shampoo that really works, we suggest that you use Clear Men 2-in-1 Anti-Dandruff Daily Shampoo & Conditioner. With regular use, it will help eliminate dandruff symptoms like itching and flaking. This shampoo has natural ingredients that help prevent dry scalp. In addition, the added conditioner will help keep your hair manageable and shiny and will also leave your hair smelling nice. This shampoo is specially engineered for men so, if you are a guy or if you know someone who is still trying to find a solution for his dandruff problem, we recommend Clear Men 2-in-1 Anti-Dandruff Daily Shampoo & Conditioner because this might work for you.